How Long Does It Take to Sign Home Buying Documents? How Long Does It Take for Signing Home Buying Documents? Buying a new home is an exciting adventure, but along with it comes loads of documents, contracts, and other paperwork that needs your approval and signature. Some of your home-owner friends may tell you that you'll be signing away your life at the title company when you show up for your closing appointment to sign the home buying documents. What can they possibly have you sign that could take so long or be that involved? Your lender, on the other hand, may say that it should only take 20 minutes. What's the real story, and how long does it take for signing home buying documents? Many new home buyers get impatient and frustrated over signing all of the closing documents, and it's possibly more paperwork than you've had to deal with for anything else in your life. 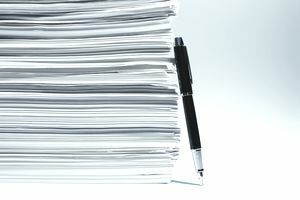 The paperwork required to sell a home is often much less voluminous than the documents for a buyer. The most important thing you need to focus on is checking the accuracy of the paperwork that you sign. If you are paying cash, you'll have minimal home-buying paperwork, but most buyers finance the purchase of their home, and most of the home-buying documents are required by the bank. Although it would be embarrassing for a lawyer to admit she signed a document without reading it, even lawyers skip over reading all of the documents involved in a home purchase, because not all of them contain important information. Home buyers who are lawyers generally do, however, read the following documents and scrutinize them for detail. As a home buyer, you should, too. Many of the documents are forms a buyer could be sued over or suffer consequences from if the information the buyer provides is untrue, which makes people hesitate, even though they have no intention of giving false information. As a buyer, however, you must sign all of the required documents if you want the loan. terms for acceleration or alienation. If you do not understand debits and credits, ask for an explanation until you are satisfied. Many intelligent people, including those in the real estate profession, do not understand how to read a closing statement, finding debits and credits confusing as well. A grant deed is not one of the documents you need to sign during closing. The buyer does not sign the deed, which tends to astonish some people. If you buy a car, for example, you might sign a title document accepting ownership of the car. It's different when you're buying a home. The seller will sign the grant deed or warranty deed, not the buyer. You'll also need to sign a certain number of documents that seem like they're inconsequential, but every document in the process serves a purpose, and will still need your signature as the home buyer. For example, other documents can include legal forms that guarantee that you have not lied on any of the other documents you've signed. You might need to sign various versions of this, as one document stating that you are telling the truth is often not enough for the bank's legal department. The legal forms will paraphrase and restate, and sometimes the documents are identical to the previous documents but a home buyer still must sign them. Even if you question the need for some of these documents, don't refuse to sign. Without your signature on every necessary document, your closing will be delayed. Some people have gone so far as to complain to the bank, and in some cases were informed that they could go elsewhere to get a mortgage if they had issues with the documents or the process. You might also be asked to sign documents that say you have used different names or could have used different names on other documents or in any other situations. To protect both you and the bank from forgery, you might be requested to sign various forms of your signature, with an initial, without an initial, with your middle name spelled out, and every other kind of variation possible under the sun. Don't be surprised if you are asked about the condition of the home and to rate it from excellent to good/average/fair or poor. You may be required to sign an owner-occupancy certification. This is a document the bank can use to call your loan due and payable if you don't move into the property.